Each selection fed to your Cave Bro is broken down into Fruits, Veggies, Grains, Proteins, and Dairy and is highlighted in the food plate provided. 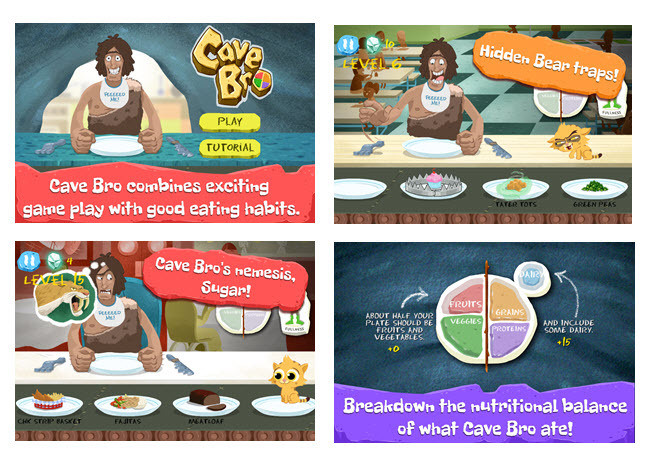 With the plate as a guide, players receive points and gem rocks for making healthy choices and feeding Cave Bro balanced meals. Each round gets tougher, and new levels unlock more challenging food selections and locations. 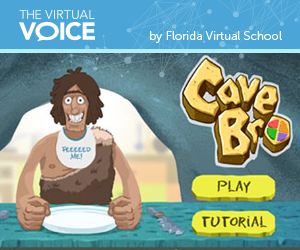 FLVS joined forces with Fablevision, a leading media and interactive development studio, to create the game. Learn more at http://flvs.net/cavebro. This entry was posted in Full Time Edition, Homeschool Edition, Parent Edition, Student Edition and tagged 21st Century Education, Cave Bro, Fitness, Free app, Free games, Gameplay, Gaming, Health, Health Opportunities, HOPE, Mobile App, Mobile Learning, Nutrition on October 10, 2014 by Guest Blogger.